Place chocolate chips and cream in a heat-safe glass bowl over top of a pot of simmering water (don't let the bowl touch the water!). Let the cream and chocolate sit untouched for 3 minutes. Whisk together until chocolate is fully melted. Let the bowl sit off the heat for 20 minutes. Pour into a flat casserole pan and cover with plastic wrap (allow wrap to touch surface of chocolate. Let refrigerate for 3 hours. Scoop chocolate with an ice cream scoop or melon baller and roll into a ball with your hands. 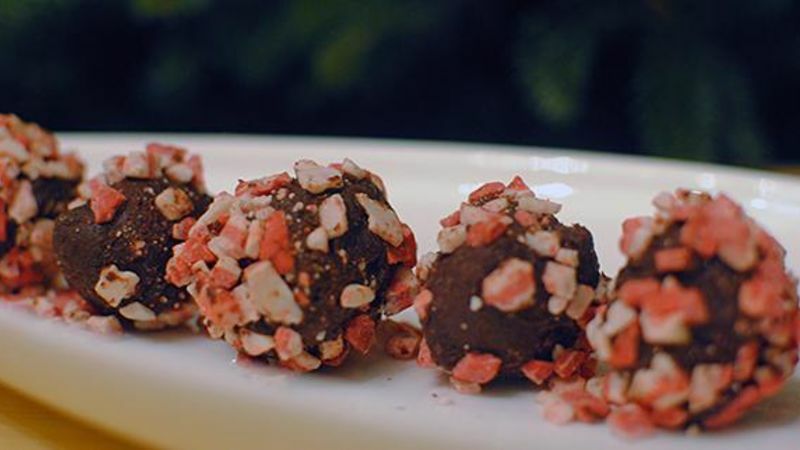 Then roll through Andes™ Peppermints, using your palms to secure mints onto truffles if needed. Refrigerate!